Better Pork June 2018 edition features Chris Crump on the front cover and the following articles: Reducing Antibiotics - Planning Ahead, Staff Retention - Overcoming Challenges, Farming Passion - Charting a Path, Build or Retrofit - Barn Decisions, and Amino Acid Feeding Strategies. 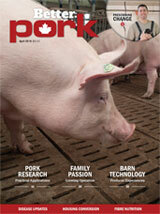 Better Pork April 2018 edition features the following articles: Pork Research - Practical Applications, Family Passion - Growing Operation, Barn Technology - Producer Experiences, & Prescribing Change. 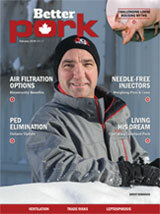 Better Pork February 2018 edition features Brent Robinson on the front cover, and the following articles: Air Filtration Options - Biosecurity Benefits, Needle-Free Injectors - Weighing Pros & Cons, Living His Dream - Operating Greyland Pork, PED Elimination - Ontario Update, & Challenging Loose Housing Myths. 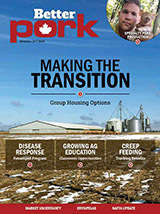 Better Pork December 2017 edition features the following articles: Making the Transition - Group Housing Options, Disease Response - Revamped Program, Growing Ag Education - Classroom Opportunities, Creep Feeding - Tracking Benefits, & Specialty Pork Production.